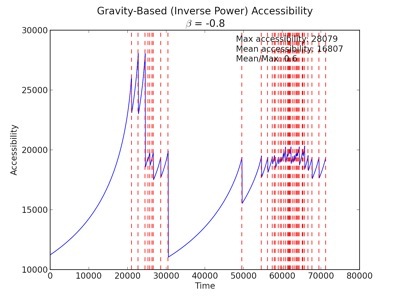 Accessibility is traditionally considered to be a property of a point or region in space, and to be invariant over time (or at least over some computationally convenient time interval). How- ever, a locations accessibility can vary over time on a wide range of scales. This temporal variation is especially significant for schedule-based transportation systems. Current measures of accessibility generally reflect the accessibility only at points in time corresponding to the departures of one or more trips; accessibility between these time points remains unconsidered and undefined. Consequently, these measures are insensitive to changes in route frequency and the distribution of trip departure times. Furthermore, these approaches ignore the disutility experienced by a system user who is limited to departing or arriving at scheduled times rather than at preferred times. As a result, they systematically overestimate the accessibility experienced by users of scheduled transportation systems. We establish new methods for representing the accessibility provided by a schedule-based transportation system from a specific location as a continuously-defined accessibility function (CDAF) of desired departure time, defined for all time points. Using schedule and route information from metropolitan transit providers, we demonstrate the application of these methods to gain new insight into the accessibility provided by real-world transportation systems. Four examples are developed to represent common service types in metropolitan transit networks. The results confirm that accessibility is significantly overestimated by measuring single points and show that trip frequency is more valuable for sustained accessibility than high accessibility on individual trips. Joined to the western half of Minneapolis (and the United States) by the I-35W Bridge, the Northeast and Southeast quarters of Minneapolis were once the City of St. Anthony. This area includes St. Anthony Main, but not the current City of St. Anthony (St. Anthony Village), or the neighborhood of St. Anthony Park in St. Paul). In 1872, the City of St. Anthony merged with the City of Minneapolis. This was a mistake and should be revisited. Northeast has 36,255 people, fast-growing Southeast has 30,490 ( 6,288 – Como, 10,015 – Marcy/Holmes, 1,309 – Nicollet Island/East Bank, 7,457 – Prospect Park, University – 5,421 (University straddles the river, so remains a complex issue)). Together, these 66,745 would be one of the largest jurisdictions in the metro area and the state (technically 8th, above St. Cloud, below Plymouth). The area is geographically coherent, and has a strong identity. 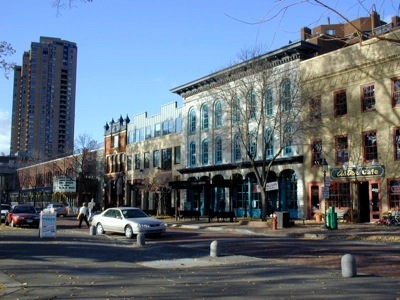 Containing the main campus of the University of Minnesota, it has a long-lasting economic base. Really, what does Minneapolis do for the East side of the Mississippi River that it cannot do for itself? We Easterners get taxed to support West Bank entertainment districts, stadia, and so on, that we did not vote for. We see our public schools and libraries closed when budgets are tight. (There is only one remaining public high school on the East side). We don’t have full representation in the Grand Rounds, the only missing link is on the East side. To be blunt, we are being dissed. Evidence that merger was not a good idea is border stability. Consider all of the other adjoining jurisdictions that have opted not to merge with or be annexed by the City of Minneapolis. It is just possible they were wise and the early politicos of St. Anthony bet wrong. Local governance is a virtue, it brings government closer to the people. I have my doubts that the current mayor has ever crossed the River except on his way to St. Paul to prostrate himself to sports-team owners. If independence is good enough for Richfield, Edina, St. Louis Park, Golden Valley, Robbinsdale, Brooklyn Center, Roseville, St. Anthony, and St. Paul, it should be good enough for the East Bank. Regionalists will say the last thing we need is more fragmentation. But I argue we should view this not as a threat to regionalism, but an opportunity to realign government functions with jurisdiction. That which is best done locally, should be done locally, that which is best done at the metropolitan level, should be metro-wide. A new government is an opportunity to reset fixed arrangements, to de-stultify government (and Minneapolis City Hall is nothing if not stultifying, the Public Schools are even worse), to rethink how services are best delivered. If we agree on the proposition, we then must discuss the name. The “City of East Bank” sounds too much like “East St. Louis”. Unfortunately the name “St. Anthony” is already taken, in spades, so I suggest the “City of St. Anthony Falls.” It is poetic, refers to a natural feature (rather than the saint himself), and evokes the history of this place that has been absorbed by its western twin.